May 30, 2012 - PRLog -- June 26, 2012 will see the soundtrack to the human and individual struggle to live free drop, courtesy of French music consortium ALTERPROD/ALTERBEATS. The French Revolution serves as the debut LP for the collective of producers, graphic designers and videographers. Boasting guests appearances from likes of both legendary and underground mainstays, such as Sadat X, AG, Chief Kamachi, Block McCloud, Reef The Lost Cauze, Bekay, Red Eye and Shabaam Sahdeeq, among others, the album will be available both via digital distribution and as a CD sold through several record shops and online outlets. Through struggle comes liberty. Representing a uniquely French twist and tale of social unrest and anti-government sentiment, the Alterbeats collective spoke about the new album, explaining: "This release represents our own revolution on several levels. We've taken a DIY approach for this album, where we have all brought different strengths to the table, from production, graphic design and videography. We've pulled together like a self-reliant brigade, but we could not have done it without the support of all the artists, both abroad and domestic that helped contribute to this project. All of us are eager to get this out to the masses and stake our claim to the culture." Further cementing the ties between France’s struggle for freedom and today’s, The French Revolution’s cover employs the use of very suggestive iconography to tell this story. From a female soldier symbolizing Marianne, a central figure of the French Revolution, to her holding of a French blue, white and red flag, which at closer looks resembles a Shemagh, the symbols are used to reinforce the concept of the liberty that came about as the result of the revolution. Although historically, this apparel when wrapped is associated with terror, it’s employed on this cover to reinforce the concept of a few uprising against many, a theme central to The French Revolution. In the background sits and illustration of the “Arc de Triomphe,” which is symbolic for freedom and triumph of Democracy over the French Monarchy. Alterbeats brings its deep experience with a bevy of collaborators and renowned emcees such as Tragedy Khadafi, Main Flow, Termanology, Blaq Poet & M.O.P. among others. Their previous discography includes Halfabrick & Alterbeats’ Revolutionary Tactics (Part 1 & 2), Amadeus The Stampede’s Universal Language and DJ Modesty’s King From Queens (Part 2 & 2.1). 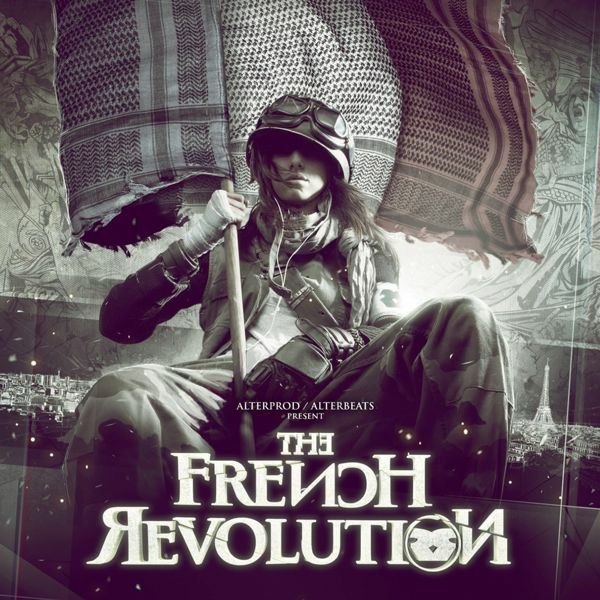 Sure to be one of the most significant independent hip-hop releases this summer, The French Revolution delivers their own musical uprising through the trifecta of their production, video and design force, while providing a sobering reminder that freedom is not free. Look forward to listening as people around the globe continue to rise up and be heard in their own battles for liberty and justice.